Dear Strangers out there in Strangerville: happy Friday. Two weeks from today I'll be departing from the land of coconuts. With each passing day I become more excited and more nostalgic at this prospect. Some moments I think, "how can I possibly leave the most beautiful piece of Earth for the comparatively barren frozen wasteland of Salt Lake City?" And then I'm like, "oh yeah. BURRITOS." It's been a bit of a rough week in some ways. Not a bad one. Just sort of difficult. Difficult is ok. That's what ice cream and yelling at the T.V. are for. Rilong, her brothers, and John Thing in the house. At the church just a few hours before Daniel's departure. Daniel with some of the kids just after church. We hosted a Saturday morning breakfast and guitar jam with the church kids at our place. All of them were LATE. Part of the Malaria Garden. What the crap? No pun intended. TAYLOR BERRETT--one of our Strangers and someone I'll call a friend--has recently signed with Warner Brothers Records. He's an unbelievably talented musician with a modern Paul Simon-esque sound (the highest compliment that can be given to any artist). His music is getting the most playtime currently on my what the kids are calling "the ipods." Check out a video of one of my favorite songs. Another favorite here. And hurry and become a fan before he turns into a superstar so that the hipster in you can brag to others that you liked him way before he was big. The only way Alfred Hitchcock's "The Birds" could have been more terrifying. Thanks, Lori. Fashion predictions for the year 2000 from the 1930s. Thanks, Brad. 10 habits that steal your happiness. This is amazing. I've written "consume less, produce more" on a sticky note and stuck it to my computer monitor. It's next to the one that says "buy more rat poison." I just noticed that America's favorite mom checked in this week. Thanks, June Snapple. One Stranger drew some pictures of her favorite Stranger posts. WARNING: her Leotrix will haunt your nightmares for time and all eternity. Thanks, Jae. And finally, one Stranger informed me that the International Astronomical Union is looking for public input on what to name a bunch of planets. I bet if we all email and plead, we can get them to name one "the Queen of Colors?" Suggestions may be sent to iaupublic@iap.fr. Thanks, Kenneth. Eli, I have a serious question. Could you be any more attractive?! No. This is the most attractive I could possibly get. I will only go downhill from this point. Eli, you're wrong. If you married me, you'd look oh so much more attractive. Like you wouldn't believe. Eli, every time you mention how many weeks you have until you get back, you remind me of those people on Facebook that do countdowns. "2 weeks until we are married for all the eternities... aaaaah!! #love #cantwait #thisisreal #honeymoon #traveling #mylifeisamazing" Anyway, you get the idea. (But I'm totes looking forward to you coming back). Wink. I'm going to start just posting pictures of me holding up an object with the number of days left written on it. And I'll be making a super cute "surprised" face while not looking at the camera. Bonus points if you do it in the bathroom. EXTRA bonus points if he does this while planking. Eli, on that first picture you totally blend in with the wall/column next to you. Just emailed the planet people! One QofC coming right up! Taylor Berrett is crazy talented! Thank you for sharing his videos. Agree and agree! I hope he makes it big. I listened to some more of his stuff and loved his Rhianna and Adele covers and the studio versions of some of his songs. Such an enchanting voice. Have a Great Weekend, Eli! That Taylor is excellent, thanks for sharing! Thanks for the distractions - it's a good batch this week! That cat is priceless. Can I teach my dog to do that? The sad part about the fashion predictions is that most of them are right. 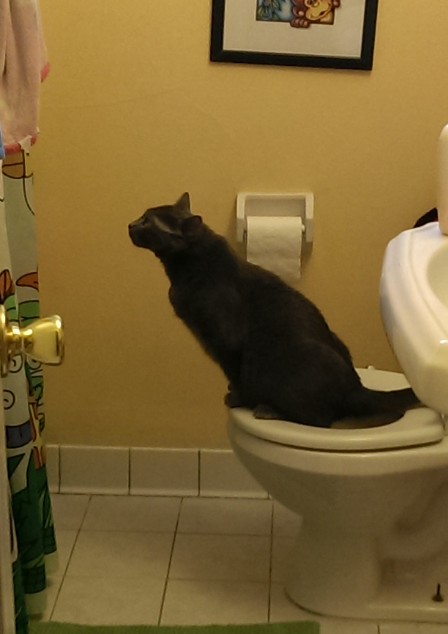 I've heard of cats becoming toilet trained, but seriously? Seriously?? That clothing of the future video had me laughing for about ten minutes straight. :) So funny! Taylor Bennett sounds like Coldplay to me. Thumbs up! I had a hard enough time teaching my kids to sit on the toilet like that. To train a cat? Tempting.......but no thanks. My grandmother actually had one that trained itself. It was a weird cat to begin with (a little redundant, I know.) I guess she got tired of doing her business in a box? *sporadic coughing* Is this friend/singer of yours what the kids these days call "single"? you look like a ghost in these pictures. are you sure you're alive and not just haunting us all through this blog? Woah! Somehow I missed this distractions page... and I'M ON IT! How did I not see this before? I feel like a life goal has finally been achieved! Daniel is Driving me CRAZY.